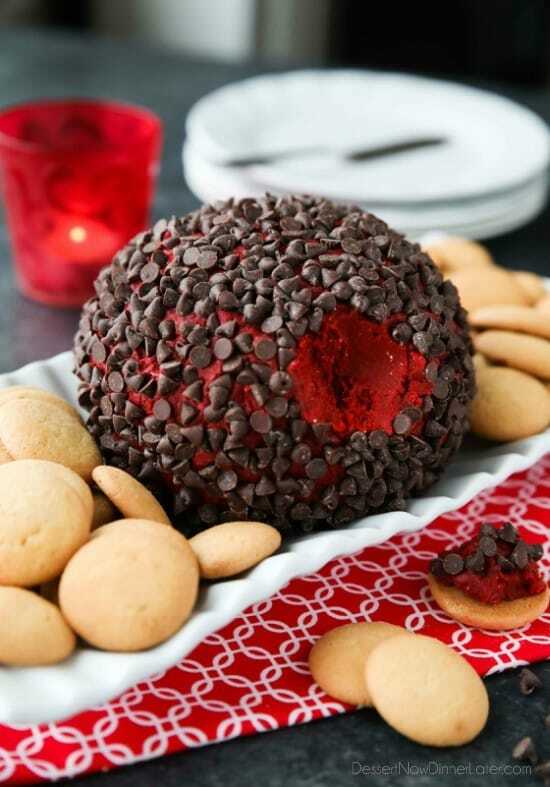 Red Velvet Cheese Ball - Dessert Now, Dinner Later! 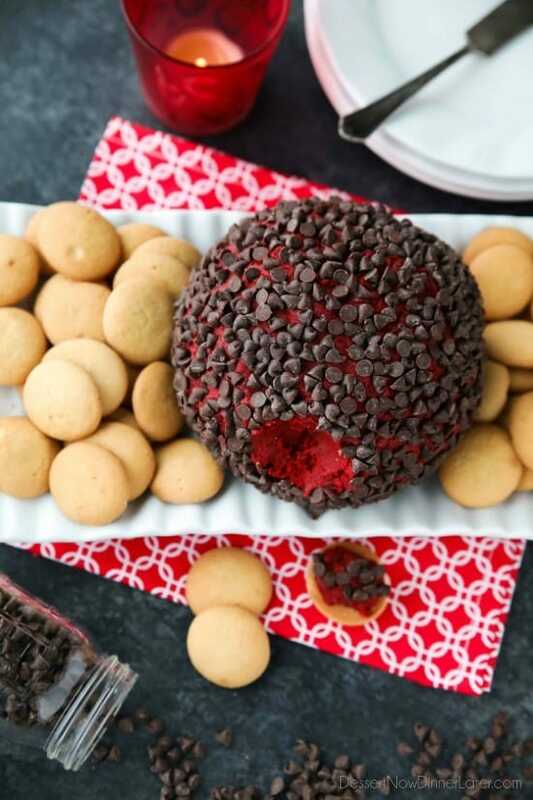 This Red Velvet Cheese Ball makes a delicious party snack or dessert. 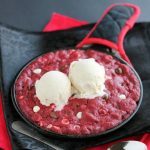 Serve it at Christmas, for Valentine’s Day, or whenever. 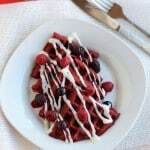 It’s delicious with vanilla cookies or graham crackers. 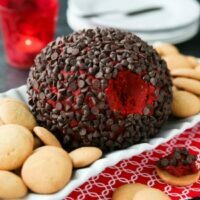 I’ve seen this red velvet cheese ball from Deborah at Taste And Tell floating around Pinterest for some time now. A sweet cheese ball intrigued me, but I actually didn’t get around to tasting it until someone brought it to a favorite things party my friend hosted last month. 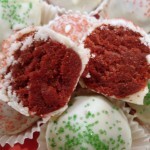 I wasn’t sure I would like a red velvet cheese ball because I was worried it would be too sweet. Boy was I wrong! It was actually so good I went back for seconds. 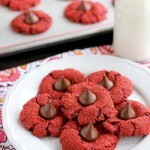 It’s creamy and flavorful without being too decadent, even with the cookies. Which also makes it pretty dangerous because you can definitely get carried away with eating it! Deborah’s original recipe only uses 1 1/2 cups of red velvet cake mix, but I used the whole box because I didn’t want to figure out how to use up the leftover mix and it still tasted just fine. 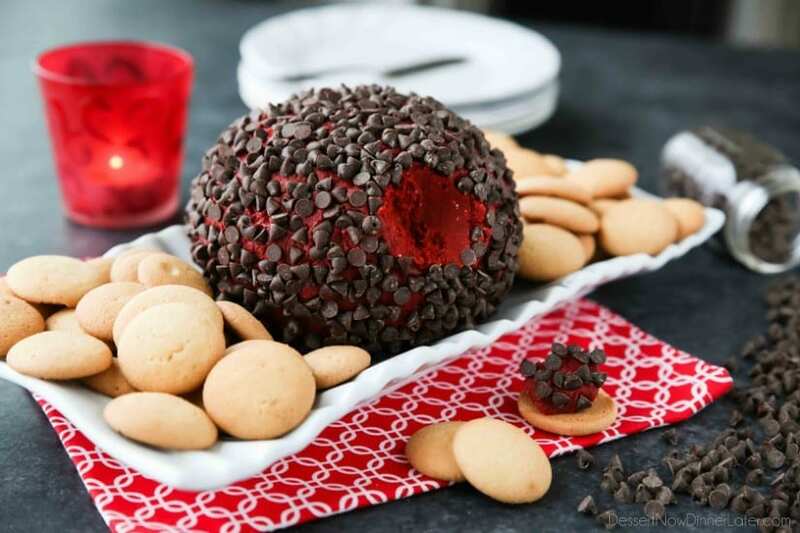 I prefer to eat this red velvet cheese ball at room temperature because it’s softer and easier to serve and eat. Definitely give this a try for your holiday parties! The red is stunning for Christmas or Valentine’s Day! In the bowl of a stand mixer with the paddle attachment, beat the cream cheese and butter together until smooth. Add the cake mix, powdered sugar, and brown sugar. Mix until incorporated well. Scrape mixture onto a large piece of plastic wrap. Use wrap to shape mixture into a ball. Refrigerate in plastic wrap until firm enough to handle, about 30 minutes. Place chocolate chips on a plate. Unwrap cheese ball and roll in chocolate chips. (*TIP: To keep from getting too messy, use the plastic wrap to help you roll the cheese ball.) Serve with vanilla cookies, graham crackers, etc. *Best served at room temperature for ease of scooping and eating. Can’t even believe this is actualy a cheese ball, it looks incredible! I’ll sure give it a chance to amaze me!